This has been one heck of a long journey!! I still haven't 100% decided on the best way to load all the data that the menu needs, but for the most part, it is at least functioning. You can select a pack, and it'll then play through the 4 levels, giving you a little lit-up square for each level you manage to beat. In Story (still not sure it's having a story!) mode, it'll do the typical grid-unlock that regulars will be familiar with. In "My Levels" and "Online Levels", all the level packs will be unlocked. .. because it doesn't make sense to lock them up! I guess I now need to start worrying about how to store internal levels. I originally wanted to just plonk the data into the sourcecode, but recently doing Quadoban2 has taught me that doing that will no doubt crash the 3DS. 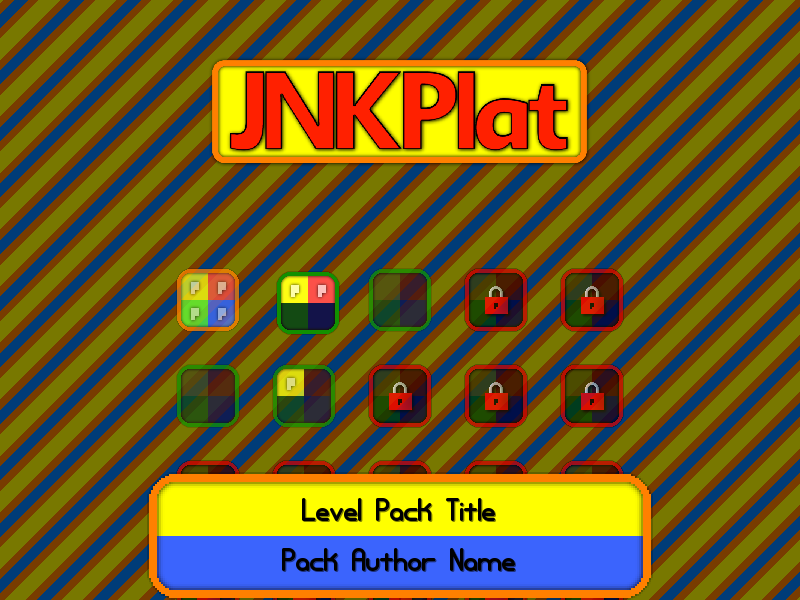 To be honest, it's all a bit of a moot point right now, as I still need to MAKE those 100 levels, as well as decide on whether I'm really going to add a storyline to a JNKPlat game! !